Cable returns, Guillermo del Toro pens vampires, and a ton of other craziness hits stores this comic book Wednesday! Boy howdy, there's a truckload of nifty stuff hitting the spinner racks come Wednesday. Among many things, Secret Wars is back in print, a fairy tale by Persepolis' Marjane Satrapi gets an English adaptation, and a big story arc on Uncanny X-Force wraps up. Let's dive in! 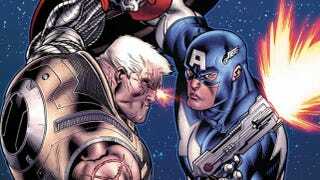 From Marvel, there's the Cable versus the Avengers miniseries Avengers: X-Sanction — writer Jeph Loeb was on hand to talk that comic up recently. There's also the miniseries Carnage U.S.A., which sees Spider-Man's symbiote nemesis running amok in America's heartland. Over at Dark Horse, John Ostrander pens Star Wars: Agent Of The Empire - Iron Eclipse, which is about a secret agent wending his way across the Empire. There's also the first issue of the comic book adaptation of Chuck Hogan and Guillermo del Toro's vampire novel The Strain — you can read our recent interview with the director about that here. As for DC titles, there's a new Ray miniseries penned by Jimmy Palmiotti and Justin Gray (here's some info on that). Also, the Vertigo: First Blood anthology rounds up the first issues of Sweet Tooth, iZombie, The Unwritten, and American Vampire all in one place. First off, there's the finale to Rick Remender's "Dark Angel Saga" storyline in Uncanny X-Force come Wednesday. Here's our interview with the author and an exclusive sneak peek at that title. We also previewed this Wednesday's issue of Suicide Squad, which you can check out here. Finally, here's an art preview of this week's issue of S.H.I.E.L.D. Isaac Newton versus the Marvel Universe! Check out an exclusive art preview of Marvel&apos;s S.H.I.E.L.D. You can also check out new issues of Atomic Robo And The Ghost Of Station X, Snarked, Demon Knights, Buffy The Vampire Slayer, Orchid, Batwoman, Frankenstein Agent Of S.H.A.D.E., American Vampire, The Unwritten, Locke & Key: Clockworks, Star Trek/Legion Of Super-Heroes, Avengers 1959, and The Walking Dead. If you want every single new DC comic from last September all in one place, the 1216-page DC Comics: The New 52 hardcover anthology is on the stands. Other heavy buys this week include the third volume of Absolute Promethea, the second Walking Dead omnibus, and Secret Wars I and II. The most toyetic comic crossover ever, back in print! Other new graphic novels on the stands include Fables: Superteam, a reprint of the fifth volume of Hitman, the fifteenth volume of The Walking Dead, a reprint of Jonathan Hickman's The Nightly News, the Rocketeer Adventures anthology, Hickman's new time-traveling book Red Wing, and Brandon Seifert and Lukas Ketner's rad supernatural horror medical procedural Witch Doctor. As far as old-school material there's the first volume of Don Newton's Tales Of The Batman, Showcase Presents: Batman, Volume 5, and Showcase Presents: Wonder Woman, Volume 4. There's also the English-language adaptation of Marjane Satrape's fairy tale graphic novel The Sigh and a collected comic anthology of Jim Henson's Storyteller series featuring creators like Roger Langridge, Marjorie Liu, Jeff Parker, and Francesco Francavilla.